Aero79 is light theme with a calm and peaceful feel to it. Comes in 2 colors: light blue and light brown, called Aero79 and Terra97. 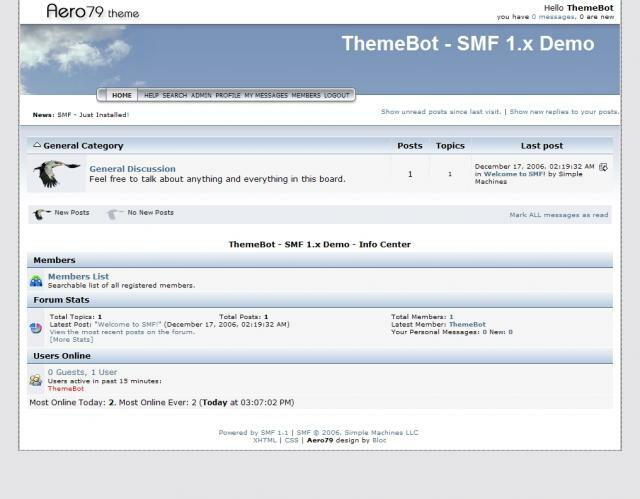 You can select those in admin - current theme section. In addition there is no less than 5 html boxes for you to insert html codes into, they will show up on 1.) above forum 2.) left of the forum 3.) right of the forum 4.) between userinfo and forum and finally 5.) below the forum but before the copyright. Graphics are free to use in a SMF context site.